I began reading this book well over two years ago. I described it here metaphorically as “fruitcake soaked in rum.” I set the treat aside for many months, returning to it occasionally, finally finishing it this past week. I found the material thoughtful, scholarly, and deeply spiritual. As for that subjective assessment, make of it what you will. When I put the volume back on my shelf, I paused a bit, unable to decide to place it with books on christology or books about spirituality. The central theme here is the Reign of God. Professor Lohfink opines that is the centrality of what Jesus wanted. He takes the reader through the substance of Scripture to demonstrate how the Lord’s teaching unfolded and how people accepted the challenge to discipleship. Or not. Linda Maloney manages to keep some of the sense of the German in her translation. Sometimes the material is accessible and easier. Sometimes it is quite dense and like other German theologians I’ve read, I had to take me time, retrace some steps, and go back a second or third time in order to check a point or absorb it. Often enough, I would pause and take time for reflection. This book challenged me to examine what I think about Jesus, and what he asks of me in my life. I must thank the reader who sent me this volume back in 2013. His recommendation was spot-on. 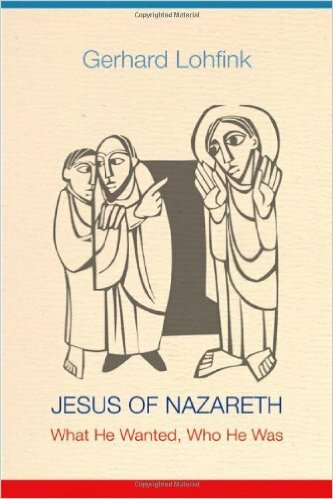 I urge any of you serious about Jesus (yes, even you, Max–some of your questions get answered here) to locate this book and read it. This entry was posted in On My Bookshelf, spirituality. Bookmark the permalink. I think I read somewhere that Lohfink claims the resurrection appearances were God using the disciples imagination to produce these encounters? Is that true? Less his claim and more a part of his critique of Enlightenment influences in Christianity. That said, how can we explain Luke 24:13-35? Does it suggest the early Eucharist and the early disciples experiencing Jesus in the breaking of the bread? And does God work through human imagination in the sense of tickling our sense of the artistic, the beautiful, and that which draws us beyond the mere surface of things? I can’t explain 24:13-35. Or any other miraculous event for that matter. But Luke 24: 36-43, the intent of the evangelist is quite clear in making the claim that they are dealing with a physical interaction of some sort. Yes does God does work through the imagination but again, not the intention the resurrection accounts as they emphasis physical interaction i.e. the empty tomb, eating and drinking, placing hands in the wounds. I think the criticism I’ve seen of “imagination” aligns with the anticipated critique of the early disciples, “They imagined the whole thing.” My recollection of Prof. Lohfink’s assessment is that he wants to give the best credence to the theory, then explore from there. In other words, find the best argument of the opposition to topple, rather than pick the worst. And yes, the resurrection narratives all employ the reminder that Jesus appeared in a tangible way: being embraced, eating fish, having wounds. Jesus is obviously no longer in the flesh among us in ordinary interactions, but Ignatian spirituality (for example) would invite us to a deeper intimacy than just knowing about Jesus–something distinct and inferior to simply knowing Jesus. And in the spiritual life, imagination is no doubt a good thing. As per your suggestion, I just ordered the book on Amazon. I look forward to checking it out. It will no doubt be a much better read than the little gem I got from the Jehovah’s Witnesses last week (what a lovely encounter) – it felt like Christmas being able to freely unwrap the ‘logic’ of their various claims. I thoroughly enjoyed it, invited them all in for coffee and cookies – I didn’t want them to leave. At least one of them was expressing some agreement with me and that was when their leader decided it was time to go! I assured them we were a house full of very happy Atheists and they were welcome to come back at anytime. I have been having a serious discussion with some of my co-actors (we recently presented a wonderful production of “The Miracle Worker”) about whether Jesus is anything more than cultural oracle upon which we put our dreams and hopes to validate them. I hope “JESUS OF NAZARETH” gives me reason to see something more. I am trying to not be so negative about the effect of religion on society – but then Ted Cruz or Sarah Palin gets a pass for some kind of insanity and I wonder where the reasonable people went.